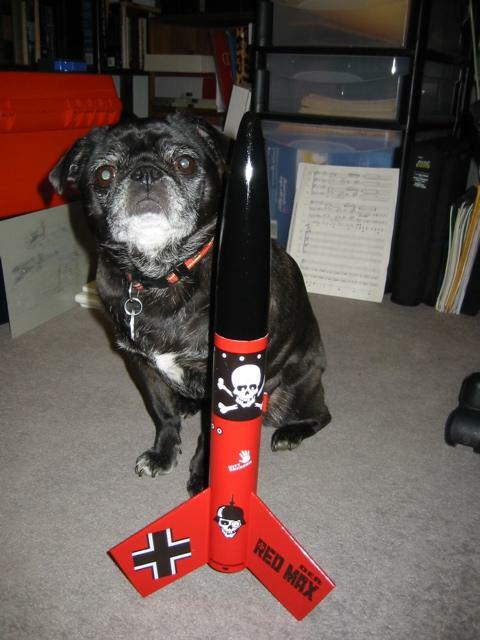 One of our guests suggested that we have a photo contest that includes our love of rockets along with our pets, so here it is! 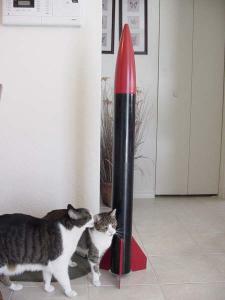 Look, consider it an opportunity to "make up" with your dear pet for all the time you have spent away from it while sanding, gluing, setting up for your next rocket flight! Spend some quality time with both of them during a photo session, out on the range, or where ever you feel it is appropriate. 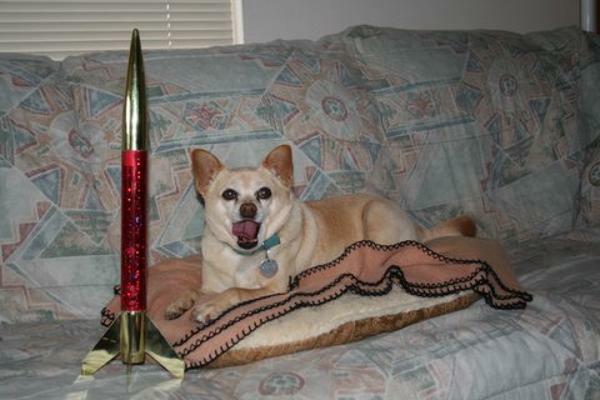 The objective is to incorporate your pet with some aspect of your rocket hobby. Winners will be judged by EMRR Guests during a voting week of April 2 - 7, 2006. Entry must be (1) - (3) photos. 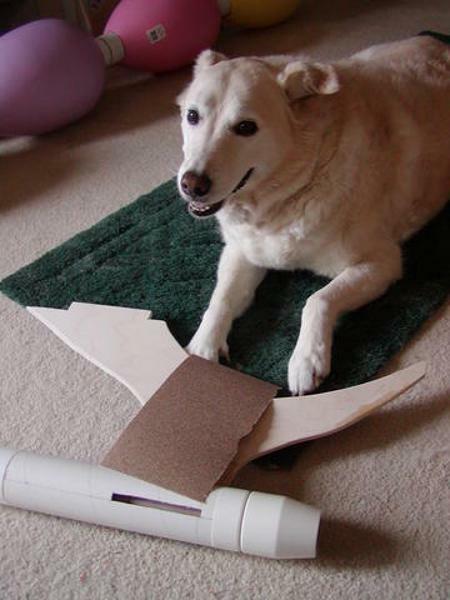 A .25 bonus vote will be gained for each vote for your entry if entrant provides one (1) picture of your pet actually getting involved in the hobby in some way. 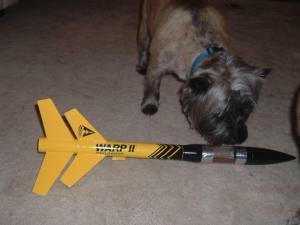 The "write-up" need only be description of rocket and/or manufacturer and model name and key information about your pet. Online Voting will take place from 4/2 - 4/7. Thrustline One "The Black Shadow" kit. The daring hamsternaut "Beary" emerges from her Goonybird Cloud Hopper (Excelsior Rocketry) after a bold flight to the far reaches of a distant galaxy. Between spaceflights, Beary trains for the rigors of intergalactic travel on her exercise wheel. 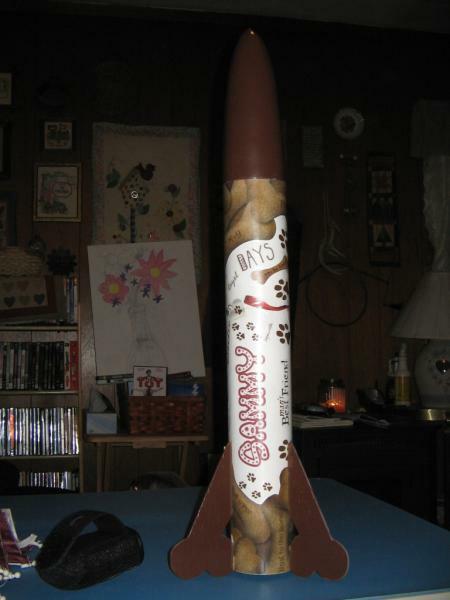 My kids, Natalie and Neil, built most of the rocket and care for Beary. 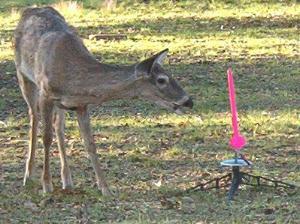 While there are many White-tailed deer in the Texas Hill Country, very few of them show much interest in model rocketry. Dolly is the exception. 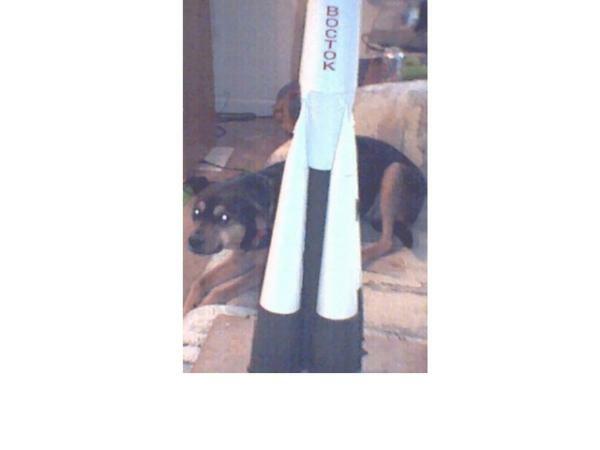 She is closely inspecting my rocket to make sure it is safe to fly. 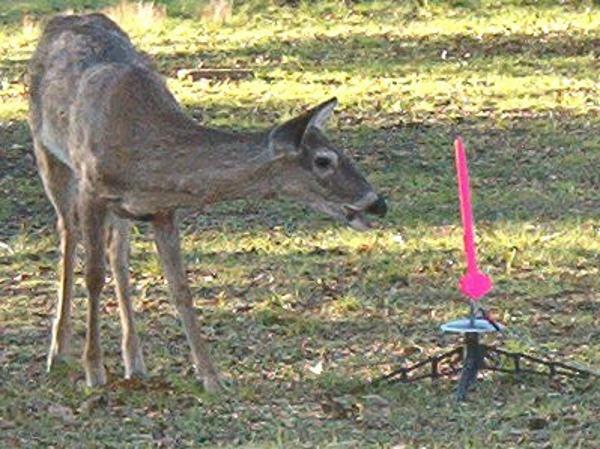 Although the deer are free to roam anywhere they want, they qualify as pets because I feed them 3 times a day. "Otis the Rocket Retriever" Otis, is a new member of our family. His previous owner had to give him up for adoption due to her poor health. We feel very lucky to have him. He is the sweetest dog. After a short period of adjustment Otis is now ready to earn his keep. 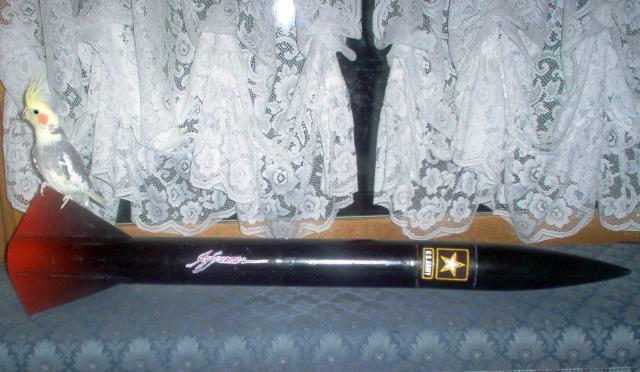 Like many other athletes he has just started spring training and is looking forward to being on the field. For Otis that means being part of ECRM-33. This is Sam. 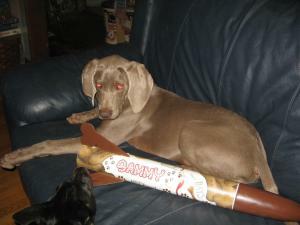 Sammy is a 16 week old Weimaraner pup. 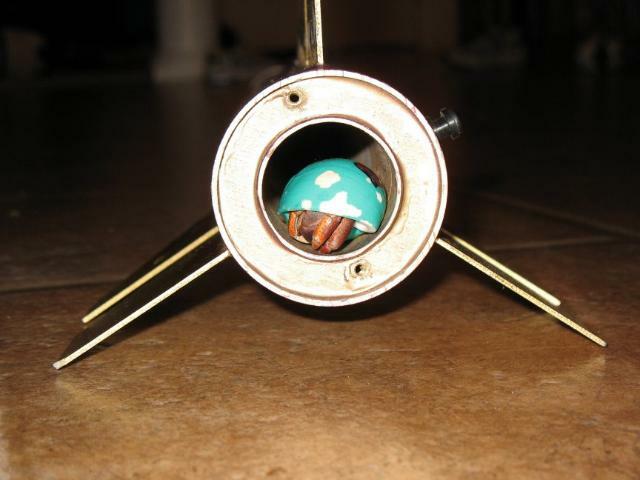 He travels with us and likes to run around when we are setting off our rockets. Now Sammy has one of his own. It's even called "Sammy". 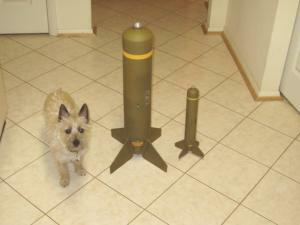 The first photo is Jerry with my Estes and scratch upscale BLU-97B Cluster Bombs (reviews of both are here on EMRR). Jerry liked them so much that he decided to practice for the auditions of the remake of Dr. Strangelove (Or: How I Learned to Stop Worrying and Love Big Rockets). I don't know if he'll get the part of Maj. T.J. "King" Kong or not. 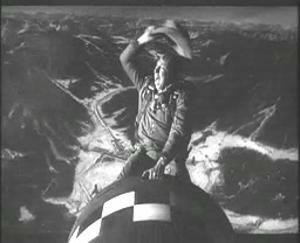 He reluctantly mounted the practice bomb, but totally refused to wear the cowboy hat. The two photos below are of our beloved Iguana Emma. 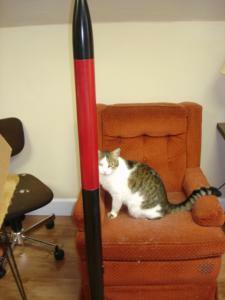 Emma helps around my rocket shop mainly by watching paint dry, serving as a perfect 6 foot measuring device and providing silent approval of all my work. 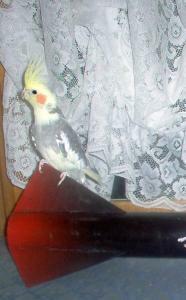 She is posing / modeling her own Talons with my other Talon. 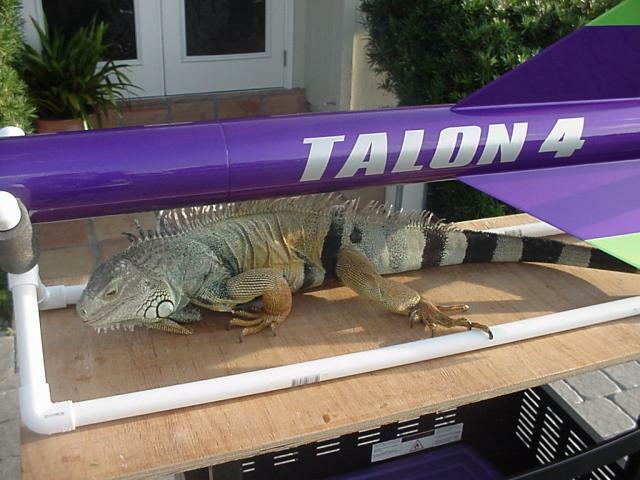 A Giant Leap 4" Talon recently flown to 6607' on a AMW K-670 GG. 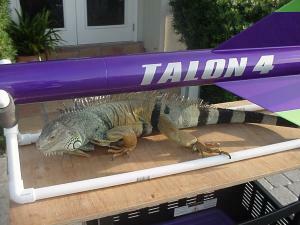 Someday, Emma hopes to be the first Iguana in space. My cat Tiger is always roaring around my workshop where I build all my rockets. 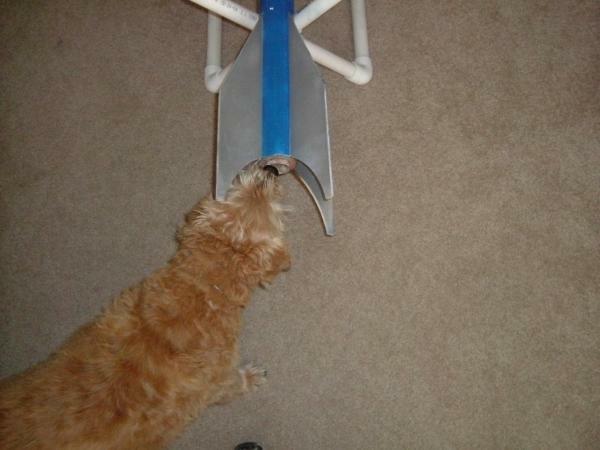 He can be very nosey at times and always wants to be helping me do whatever I'm working on. 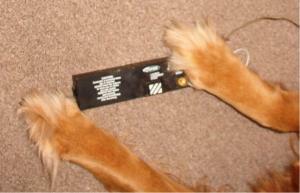 As you can see he has practiced his skills and has become very proficient at installing my recovery systems. First he straightens out the shroud lines and stares hard at his task at hand. Then he begins to fold and pack the chute. When he gets done he loves sitting back and admiring his handy work. I haven't had a failed deployment since he began putting them in. 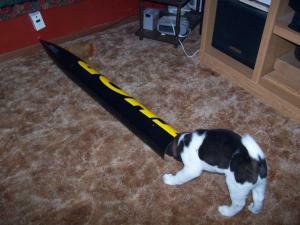 He is also great to have around to play with when waiting for that 30 or 60 minute epoxy to set up. 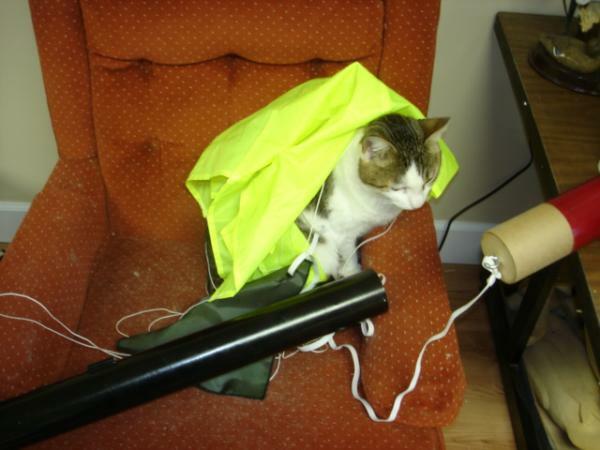 Note that Tiger prefers the Nomex parachute protectors, his claws just shred up that wadding stuff and he never can seem to get it in the tube whole. 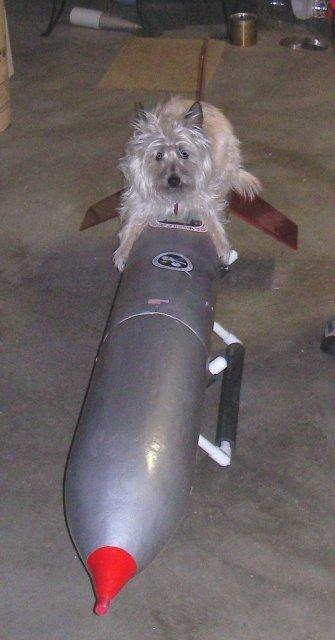 My Dog Gangster Jake is helping me all of the time in the rocket shop,he doesn't like he picture taken when he is working. So how about a shot of him getting ready for his flight in the LOC Nuke M L-3 bird. 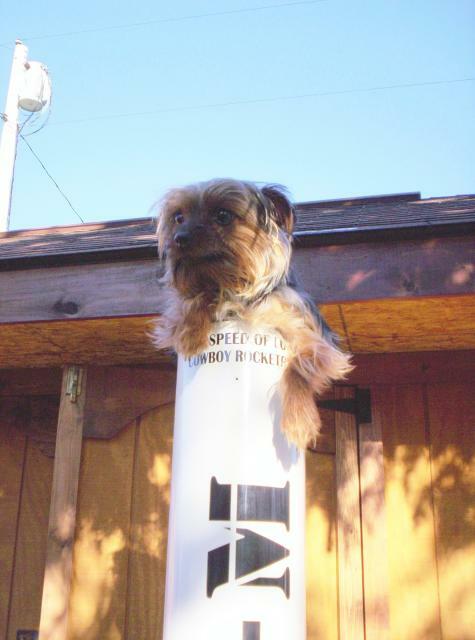 He is hoping to break Mach 1 this time. Lulu, the pug, age 8, guards my newly completed clone of the Estes Der Red Max. 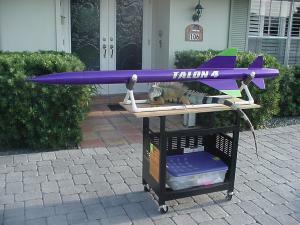 I built the rocket using BMS parts and Excelsior decals. 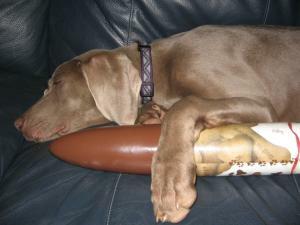 Lulu is a great companion dog. She loves to hang out with me, no matter what I am doing. Thus, she is my company whenever I am building rockets. It only seems natural that she pose as a rocket model along with my rockets. This my daughter's first rocket, an Estes Mosquito, alongside our orange tiger tabby cat, Dennis. 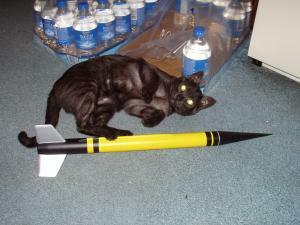 Dennis was a very affectionate cat who liked to eat a lot and sleep a lot. We disturbed his mid-afternoon nap to take this photo. Sadly, neither Dennis nor the Mosquito are with us any more. Dennis died of heart disease about two months after this picture was taken. The Mosquito suffered the fate of most Mosquitoes - it teleported off the pad and never rematerialized. This is picture of our pet cat Lila. She is one of several stray cats that we have taken in. In this photo she is checking the fin alignment of my Triskelion. 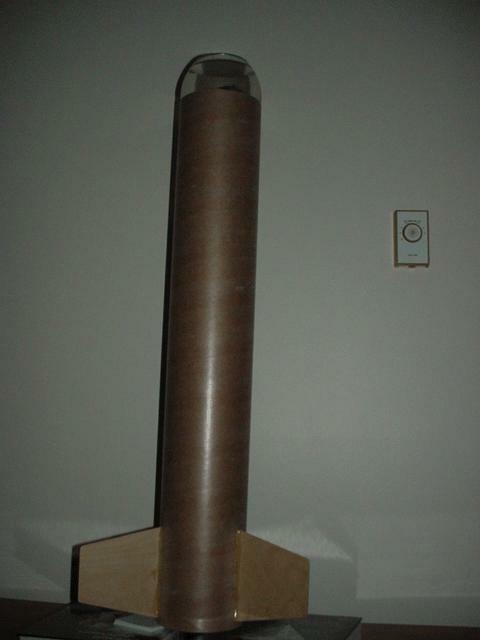 By placing her head directly against the body tube, she can sight down the tube to make sure they are straight. This little guy has been my pet for over 2 years. He sits on my workbench and watches me build all my rockets. 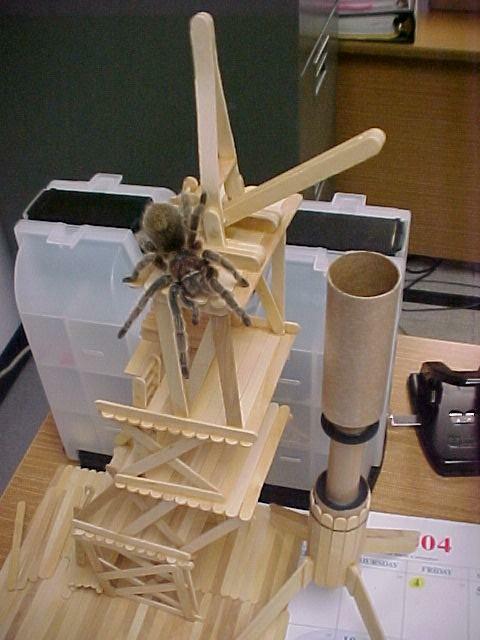 One day he decided get out of his cage and give my build a close up inspection. 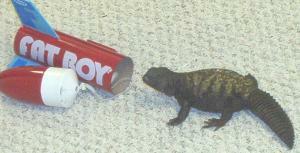 Titled: "Phil Uromastix inspects his bird". Phil is a Mali Uromastix lizard (Uromastyx maliensis) that has lived with us for the past 10 years. 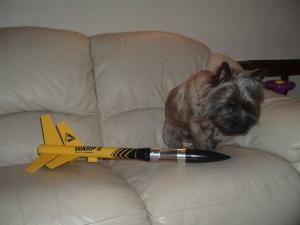 Of course he prefers short wide rockets like the Estes Fatboy! American Pit Bull Terriers: The solution to Rocket eating trees. 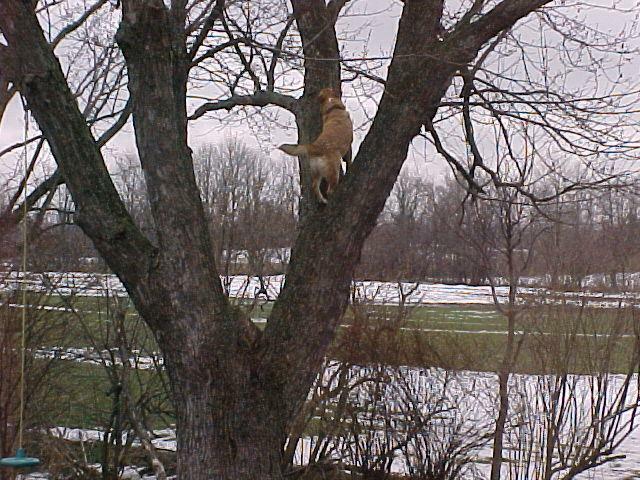 This is Blaise scaling a tree after a squirrel, but he's very smart and could be trained to go after rockets. B) An amusement ride at the now defunct Six Flags Astroworld. Akita puppy "Jersey" checking out my Level 3 Thor Jersey ready to go for a ride..."How do I get in here?" These two pics for of my cats Buddy, the large one and Sissy, the small one, both age 8 and are also brother and sister, posing with my LOC IV. 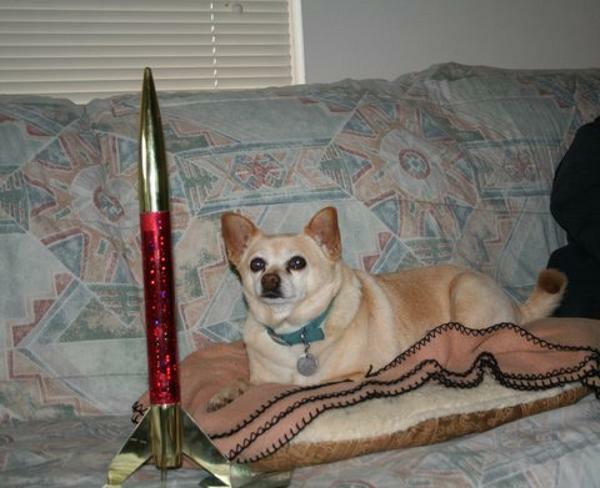 In a way, they both provide entertainment for me, wether it's building rockets or not. They both love to play with shock cords and parachute shroud lines if given the oppertunity. 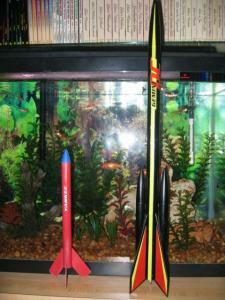 Sissy also loves to to use the fins of my rockets as rubbing posts which I find rather funny. 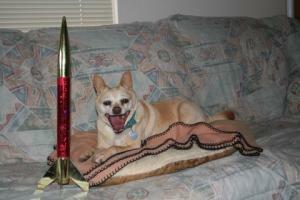 Buddy on the other hand is terribly afraid of the sound of rocket motors. 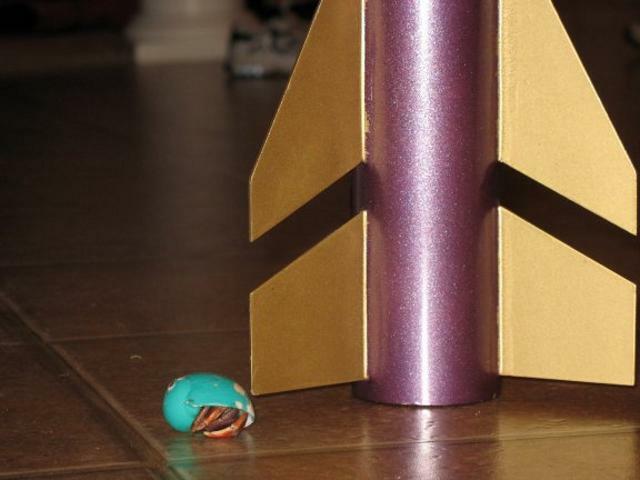 Every time I am watching my launch footage, he will run out of the room as fast as his legs can carry him. 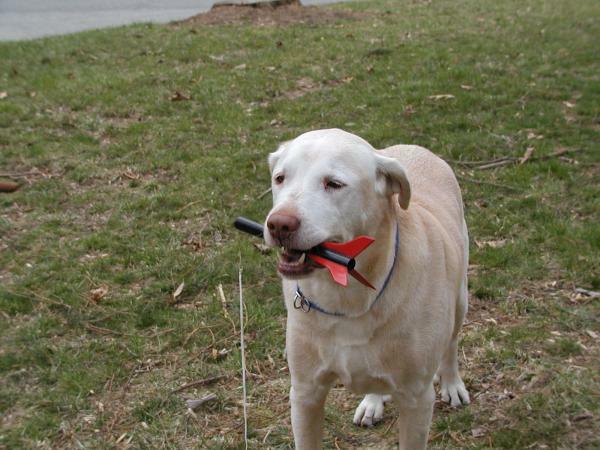 One time when I was launching MMX rockets in my front yard, he actually watched and seemed to enjoy it. The first one startled him a bit but after that, he never moved until I finished and came back in the house. 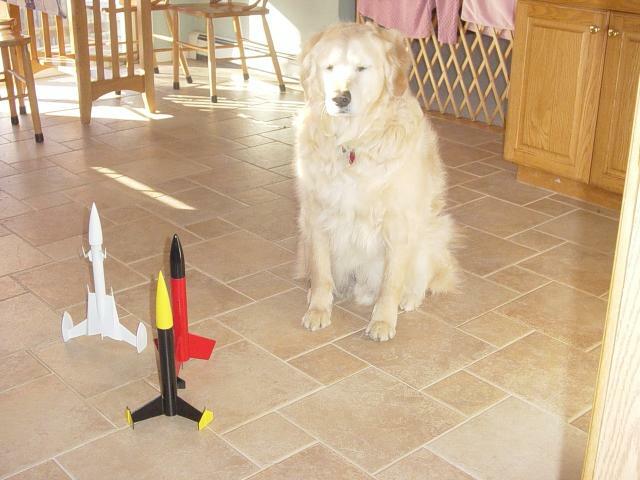 Tucker our ten year old Golden Retriever inspecting our work. I think he is upset that the Flis Kits Stingray has not been painted yet, his favorite is the Triskellion. 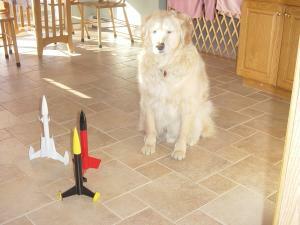 He is usually under the kitchen table while we build rockets, or eat dinner, well when ever we are in the kitchen. 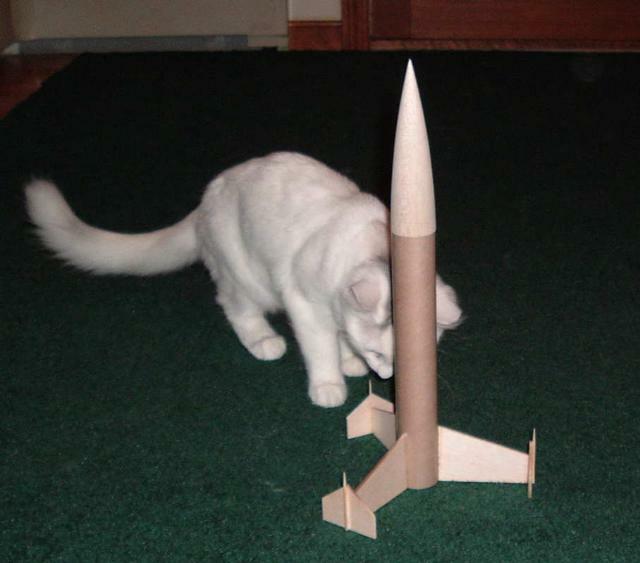 This is about as close to rockets as he will get, especially if we are launching. He hates the noise. 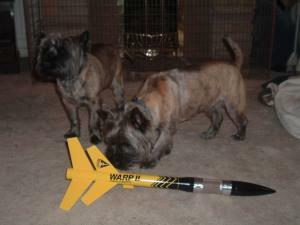 The photos show my two cairn terriers, Rusty and Douglas. They don't really like rockets 'cos of the noise and the amount of time I spend away from them flying. 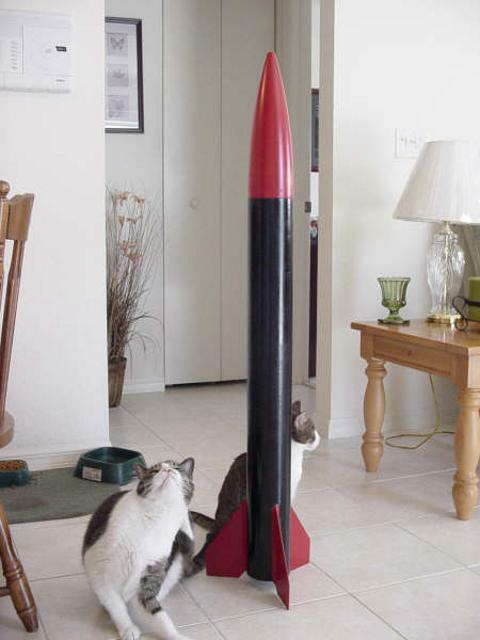 Here they are checking out a recent build of an Estes Warp II payloader (I had to put a doggy treat in the payloader to get their interest up). Even with the doggy treat loaded in the rocket, they refused to go fetch, when the rocket was launched! 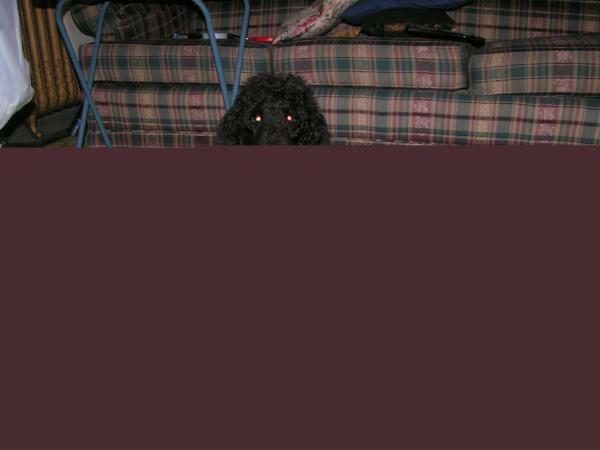 These are my crazy pets. 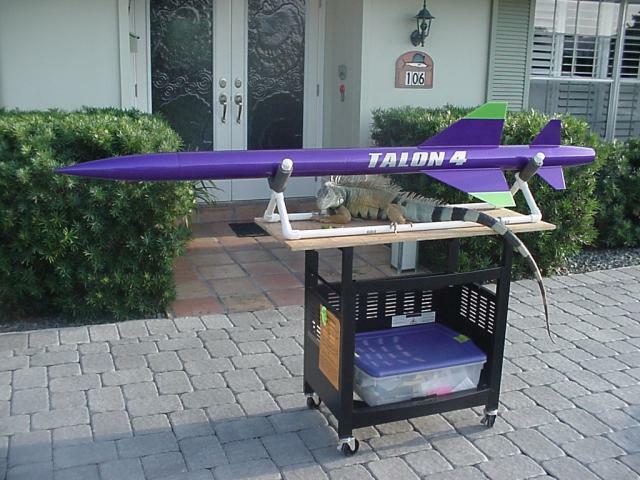 My cat Bella (one of the world's fattest cats) is helping me build my latest paper model to flying model conversion by inspecting my work (and rolling on it shortly after the picture....) Simon is a Bearded Dragon who enjoys a radical ride. 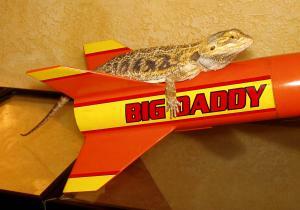 He is seen here with his upgraded Big Daddy! These are my two goony's! The one on the right is a Goony Max put together from spare parts and Phred's excellent decals. The goony on the left is Mr. Tripp in his crazy kitty pose about to wreak havoc somewhere in the house. 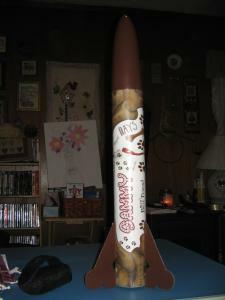 His wild outbursts have made a better modeler out of me with all the fin repairs and paint repairs I have had to make after he is finished tearing though and around my rockets on display! However he is rapidly using up his nine lives! Mr. Tripp was found at a local Petsmart and was so charming and unusual that he found a new home that day. 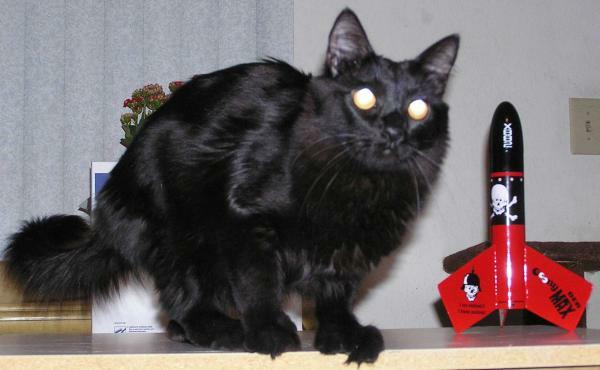 Most cats have five toes in the front paws and four on the rear. Some cats have six on the front. Mr. Tripp has been blessed with SIX toes on all four paws! Very unusual! 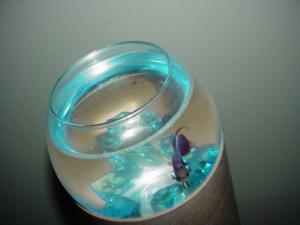 We were going to call him Chernaubal but we didn't want people to think he was radioactive! Strange that he sort of is anyway! At least in the head! These are pictures of my only flight-worthy rockets, an Estes Gemini DC and Yankee. Behind them you see my fish, 10 Goldfish, 2 Guppies, and 4 Black Tetras (Not all pictured). The fish are examining the body tube up close to check for damage that would hinder further flights (Or maybe they like the cube of fish food hidden behind the rocket). 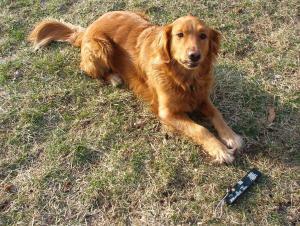 This is my Golden Retriever, Daisy. 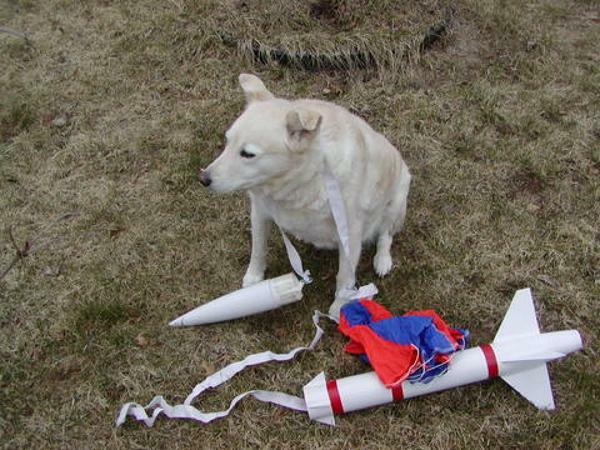 She was taken to one high power launch a year ago and became mortally afraid of launches. I'm trying to ease her out of her fear by involving her more, but it doesn't seem to be working. The first photo is of her at the field...her expression seems to say, "You say WHAT will happen if I push that button??!!" 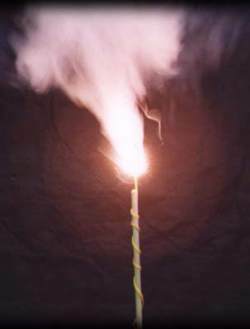 In the second, she is practicing continuity tests with the Estes Electron Beam. This are my safety inspectors, Smokey (my dog) and "Sgt. 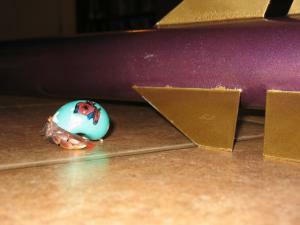 Krusty" (My hermit crab). 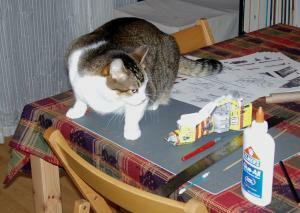 Smokey inspects my scratchbuilt "FALCON" while "The Sarge" inspects my Loki motor casing. They both like to help build and prep, but they aren't too fond of the launches; too much smoke for The Sarge and too much noise for an old dog like Smokey. "Cha Cha" is excited to witness another launch of her 18" Red Estes, Gold Series, Chrome Dome utilizing a C6-5 engine. There's no substitute for more power! 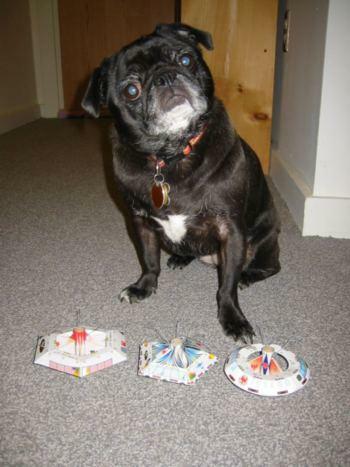 "Cha Cha" is a 9 year old, rescued Chihuahua/Pug mix. She enjoys watching Father build home made Rockets and Mom build home made Saucers. She also likes attending Launches at Fiesta Island, San Diego in the motorhome as long as there is food involved. 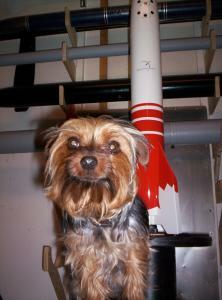 Isamu is an 11yr old puppy. Blind in one eye since birth she can't play catch well but loves to involved with the rockets. In the first photo she is examining the fins on a new rocket. Well Isamu what do you think, is it good enough? "Isamu" Ruff, Ruff.. OK Isamu I'll sand it some more. In photo two she is playing with my PML Bullpuppy. 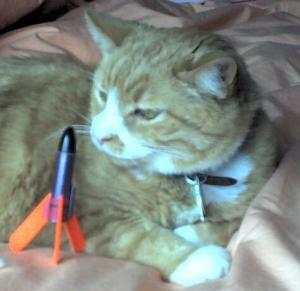 Here is a picture of my cat Todd posing with my ASP WAC Corporal. 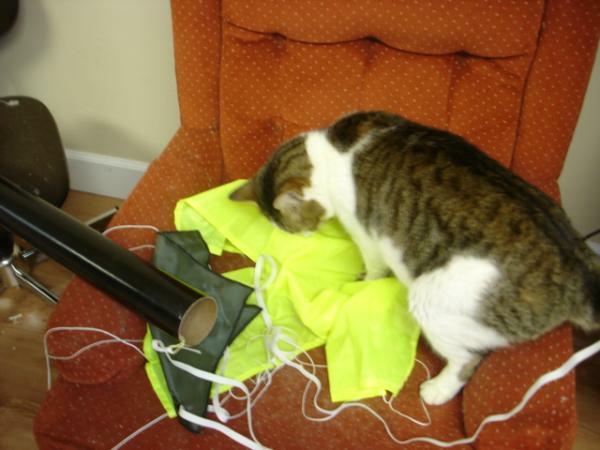 Todd usually doesn't get involved much with my hobby, except he knocks things over when I'm not around. 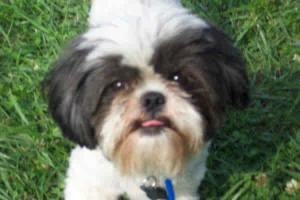 Meet Taz, he is 4 yo, 10.5 lb a Shih Tzu. 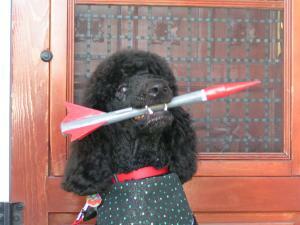 He is the mascot for the Jackson Model Rocketry Club in Jackson, Michigan. 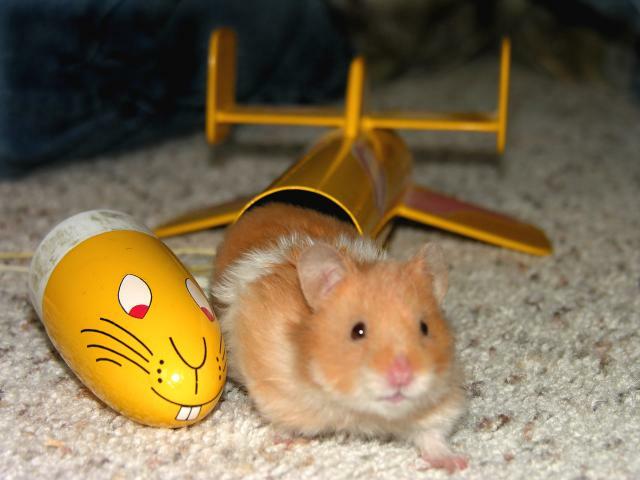 He has been going to launch's his entire life and has been to launch's in 4 States. LDRS in NY, Ohio and MidWest Power in IL, and of course Michigan his home state at MIS Raceway in Brooklyn MI, Gumbert's Field in Jackson MI, and Michigan Team 1's field in Manchester MI. 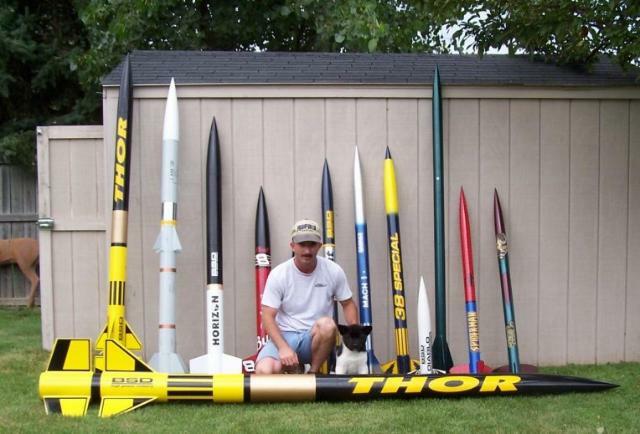 I would have to guess he has been to well over a hundred launch's. He loves to run around and play with the kids, chase wayward rockets, and go afar (should be after) stray German Shepard's that try and encroach on his rocket field. 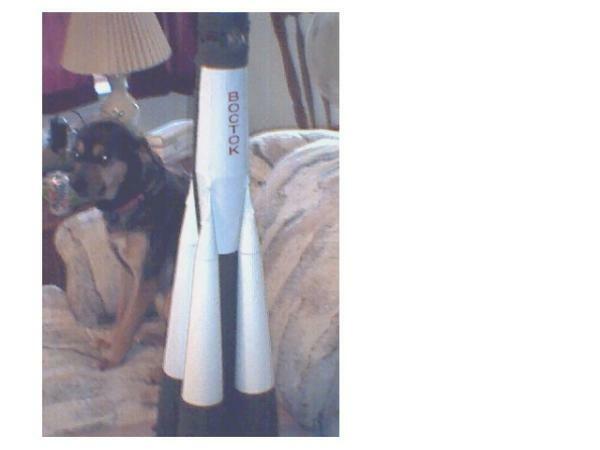 He actually watches the rockets go up, and never howls or barks like all the other dogs do. 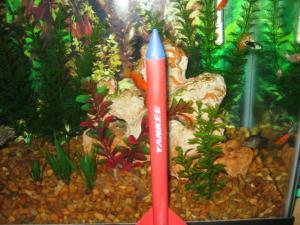 He even watches rockets on TV and goes after any animal that shows up on the tube. 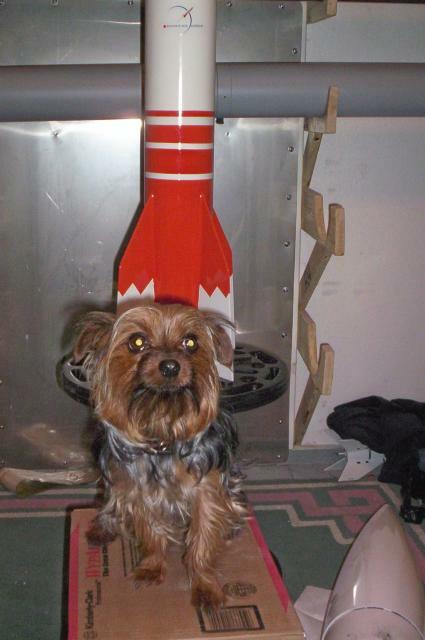 He is a very unique, one of a kind rocket nut dog. 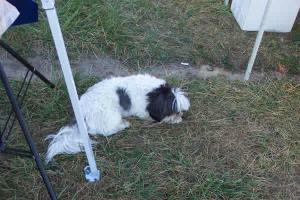 The pictures of Taz are: 1 - from Michigan International Raceway JMRC launch. 2 - Taking a break at LDRS 23 in NY. 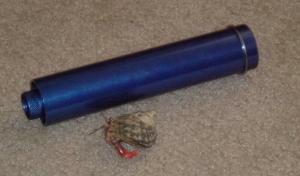 3 - Keeping watch on one of my PML Mini BBX at home. 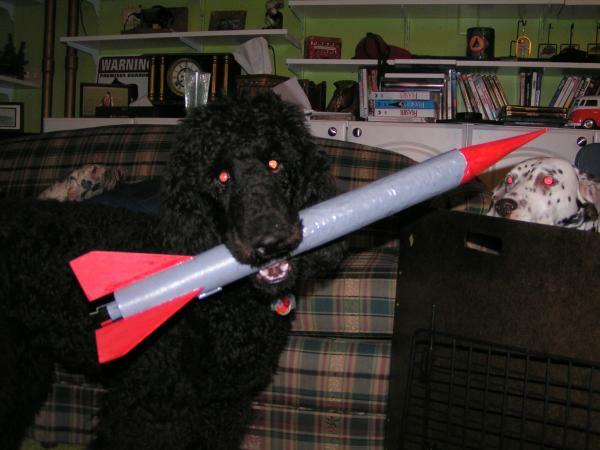 His name is Maui he is a 6 month old Standard Poodle puppy and in his mouth he has the Torpedo Mk2 & Mk3 (Mk3 is the bigger rocket) both I designed myself. 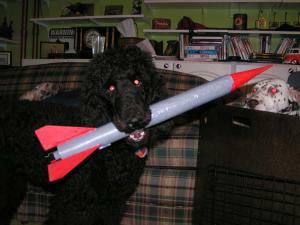 Since the poodle is a retriever when he is older I may teach him to retrieve rockets. With the Mk3 I hope to break an NAR record. 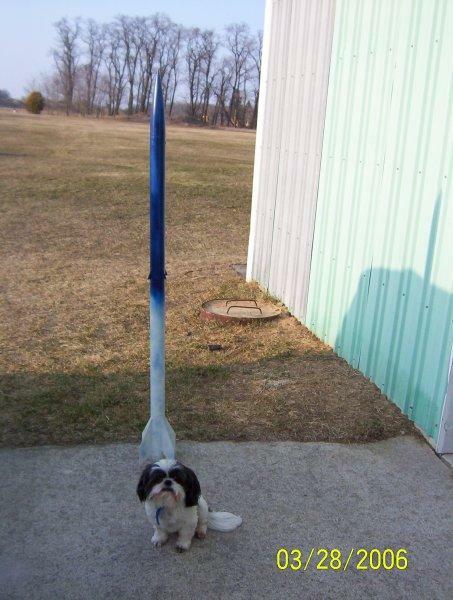 "Would this work better than dog barf?" 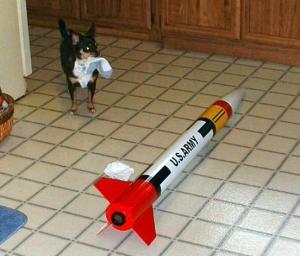 Molly my 2 year old Chihuahua - Rat Terrier mix tries to offer an opinion on what to use for recovery wadding. She forgot that my PML 1/4 scale Patriot has a piston ejection system and will not need socks as a recovery medium. Molly loves socks and will remove every one from the laundry basket one at a time until she has them all, if you let her. 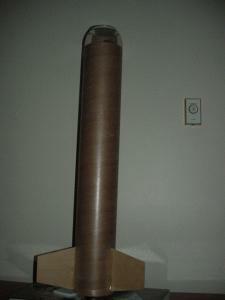 Will send picture. Here are 2 photos of Hershey with my Cosmodrome Vostok. Hershey accompanies me to the field occasionally and is a favorite of the club. She especially likes the roar of the high power birds!